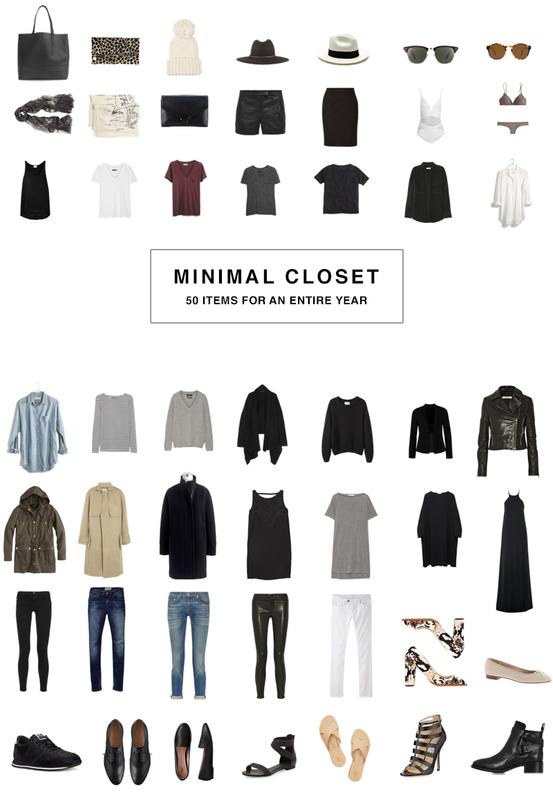 A Week in My Minimal Closet - Hej Doll | Simple modern living by Jessica Doll. Above: Cuyana Summer Hat, Prada Timeless Sunglasses, Hope Lova Blouse (similar by Equipment), Marysia Point Dume Swimsuit, Lou & Grey Boyfriend Shorts (similar by Current/Elliot), Kate Spade Saturday Sandals (similar). A couple of weeks ago when I shared the results of my huge closet clean out, I have to admit I was a little nervous. For the most part I was confident in my choices, but I was worried about whether or not having such a drastically lower number would still allow me enough versatility in my wardrobe for frequent travel and spending time in different climates. With the weather here in transition, it has been different every day. Last weekend I spend a few days down in Venice Beach, so packing for that trip was on my mind as well. Today I’m sharing 7 days of real outfits from my closet, ranging from sweaters and jeans on a plane to a more relaxed and beachy look. Worn: Emerson Fry Baseball Cap (similar), Prada Timeless Sunglasses, Madewell Just Right Sweater (similar), Acne Studios Flex Black Denim, Cuyana Leather Zipper Tote, Nike Free RN shoes. Worn: Prada Timeless Sunglasses, T by Alexander Wang T-Shirt Dress, Steven Alan Droptail Military Parka (similar by Everlane), Cuyana Leather Zipper Tote, Nike Free RN shoes. Worn: Prada Timeless Sunglasses, Cuyana Silk Cami, AG Jeans Stevie Denim (similar),Cuyana Leather Zipper Tote, Melissa Sauce Slides. Photo shoot, packing and sorting items then donating, and another photo shoot. Flight to LAX from SJC. Checking into hotel in Venice. Walking and eating our way through Abbott Kinney, and exploring the beach and boardwalk area. Worn: Cuyana Summer Hat, Prada Timeless Sunglasses, Hope Lova Blouse (similar by Equipment), Marysia Point Dume Swimsuit, Lou & Grey Boyfriend Shorts (similar by Current/Elliot), Melissa Sauce Slides. Flight home from Venice Beach, LAX to SJC. Have you recently pared down your closet? Did you have any trouble finding outfits? I love these looks! You’re making me want to pick up that Madewell sweater! I really like the format of this post because it’s so easy to envision you wearing everything when you put it all together and explain your outfits. This is so fun! I super love the denim shorts, perfect for the season! I love your 1-week outfit plans! I have always wanted to try a minimalist wardrobe!! I am going on a 2-week trip soon, and I can only bring a carry-on, so I figured this would be a little trial of bringing only what I absolutely need! Love this, more posts like this please! I’ve seen minimal closet posts and never thought I would be able to do it. Yet now that I think on it I honestly wear only 50% of my clothes if that. I love how you have base pieces for each look. Thanks so much for sharing – I may actually give the minimal life a try. Thanks for your post! I’ve just done the same thing. A huge clean out and a fresh start. I have only kept things I love and feel good in and that I actually wear. The rest I am giving away to charity. A question – how did you photograph your outfits for this post, or did you use Polyvore for that? 10 Days of Winter Outfits - Hej Doll | A California travel, life, and style blog by Jessica Doll.